Crystal Palace National Sports Centre found in the UK was opened in 1964. It is a sports centre and better yet a leisure centre with activities that are suitable for everyone. It is located on Ledrington Road, a short walk from Crystal Palace mainline station. The sports center occupies 200 acres of land in South London. Crystal Palace sports center has a wide range of facilities like the modern gym which is loved by people from the local community. The gym offers services at low costs. It has a 50 m Olympic size swimming pool. This swimming pool has been used by swimmers during the Olympics and parents taking their children there for recreation during their holidays alike. If you are not a swimmer or a fan of the gym then you should not worry since there are a lot of other excellent services offered. 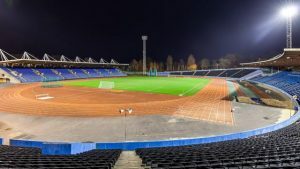 There are pitches where you can play badminton, courts, stadium and athletic tracks which have been used by world famous athletes such as Usain Bolt. It has studios, climbing walls, driving boards and a squash court. The sports centre is a very attractive place and it was built in a way that conveniences people with disabilities. It is adaptable for wheelchairs and has toilets suitable for the disabled. It ensures that all customers are comfortable. Crystal Palace National Sports Center offers parking services, poolside facilities for sunbathing and a lift so that people can save on energy while climbing the stairs. It has nice, fancy and cozy changing rooms and a brand new café where one can relax after the exercises and take a drink or coffee to keep warm. The sports centre has opening hours too. On Mondays to Friday, it opens at 0600hrs and closes at 2200hrs. During the weekends, it opens at 0830hrs and closes at 1700hrs.